The small Irish oil company San Leon Energy has been seeking capital to carry out oil exploration in occupied Western Sahara in collaboration with Moroccan authorities. Now they have obtained Norwegian assistance. On Friday, 18 September, the Irish company issued a press release on its web pages mentioning that the Norwegian company PGS has entered in on the ownership side of the company. As a result, PGS has become part owner of a company with an aggressive oil exploration programme in the occupied areas. PGS has admitted to Norwatch that they had not examined the case adequately ahead of time and emphasise that they have previously refused assignments in Western Sahara as a result of the Norwegian authorities’ advice against such engagements. Norway’s Government believes that the Moroccan oil exploration in Western Sahara undermines the UN’s peace process in the area. The fresh PGS capital, on the short side of 20 million Norwegian kroners, will strengthen the financial situation of San Leon, which has plans for oil exploration in the area already next year. According to San Leon’s web pages, the funds raised through the placing “will provide San Leon with sufficient financial and technical backing to continue to develop the Company’s exciting portfolio of exploration and development projects”. PGS made the investment by subscribing for 13,333,333 placing shares at 15 pence per share. The investment was made through an issue offer by San Leon, in which PGS bought a third of the new shares. San Leon announced that the £6.3 million that they have received by means of the issue offer will be necessary to develop projects “in Morocco, Poland, Italy and the USA”. In the “Zag” block in occupied Western Sahara, San Leon took the necessary steps up to a full exploration contract earlier this year. 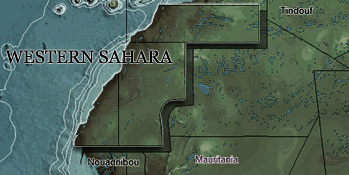 In the so-called “Tarfaya block”, also in Western Sahara, they are planning further surveys in 2010. • A UN evaluation in 2002 determined that further oil exploration in Western Sahara would be at variance with international law. • The Norwegian Ministry of Foreign Affairs advises Norwegian companies against becoming involved in Western Sahara. • In 2006 the Norwegian Government Pension Fund sold off its shares in the American company Kerr-McGee because of similar oil exploration, this too in Western Sahara. The Ministry of Finance wrote that “Morocco has for a number of years occupied Western Sahara despite strong UN condemnation. The [Government Pension Fund’s] Council [of Ethics] found that Kerr-McGee through its exploration activities most likely will enable Morocco to exploit petroleum resources in the area. The Council regarded this as 'a particularly serious violation of fundamental ethical norms' e.g. because it may strengthen Morocco's sovereignty claims and thus contribute to undermining the UN peace process’". Western Sahara’s independence movement, Polisario Front, has repeatedly protested against San Leon’s engagement in the occupied country – to, among other things, the UN’s Security Council in April. Civilian Sahrawis inside the occupied area also protest against the engagement. The above photograph shows Sahrawis in the capital, El Aaiun, taken this summer. “What implications this part-ownership would have in relationship to the involvement in Western Sahara have unfortunately not been adequately evaluated. This should have been done,” Mr. Tore Langballe, Group Communication Officer of PGS, told Norwatch after having checked the case. “San Leon has assured us that these funds will not be used for exploration in either Morocco or Western Sahara,” he asserted. “We have been assured of this. We shall now examine the contract to assess whether it in a satisfactory manner reflects this information, or whether it will be necessary to examine the system of agreements more closely together with the management of San Leon. We shall in any case make sure that they are aware of our attitude and policies, and then we shall have to evaluate our further involvement on the basis of this,” Langballe explained. In addition to having entered into the ownership side of San Leon, the Norwegian company has also entered into an agreement about seismic exploration with the company. In this case, however, PGS has made sure that the technical services do not involve areas “onshore Morocco”, which is the terminology San Leon uses with regard to both Morocco and Western Sahara. “We have on several occasions previously refused to carry out seismic explorations in Western Sahara because the Norwegian authorities recommend not operating in the area. Just a few weeks ago we also refused to make a bid for a job in Burma,” Langballe pointed out. “Because it is a part of PGS’s policy to follow Norwegian authorities’ guidelines,” the PGS director answered. Nevertheless, by entering into the ownership side of the Irish company, PGS has become the third of the big Norwegian seismic companies to have gone astray in Western Sahara. The first company was TGS-Nopec, which worked offshore Western Sahara in 2002-2003 on behalf of the American oil company Kerr-McGee. In January this year Norwatch revealed that Fugro-Geoteam also was in the process of carrying out similar offshore assignments. Fugro-Geoteam’s seismic work was terminated in March. Norwatch has previously written a report on PGS in the African island state São Tomé and Principe, where PGS obtained extremely lucrative agreements with local authorities. Download the report here.